Lotus is one of Zhang Daqian’s (1899-1983) favourite subjects. He believed that what matters in Chinese painting is the skill of using brush and ink and ‘painting lotus shows one’s basic skills’. 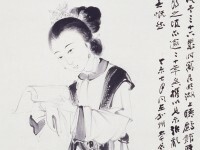 Zhang applied various accomplished skills in his lotus paintings, such as the fine brushwork gongbi style, the expressive xieyi style, the mogu ‘boneless’ style, and the use of gold, powder, and colour.